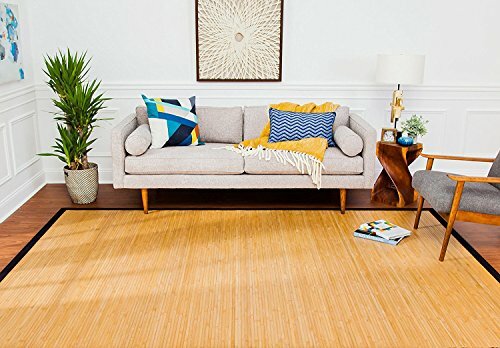 Contemporary Natural Bamboo Rug 7 feet x 10 feet by Anji Mountain. This beautiful rug is at home anywhere you are. Living room, kitchens, foyers, under dining room tables, bedrooms or bathrooms. This exquisite bamboo rug will add style and everyday durability to each of these spaces. Features 100% aged, Anji Mountain bamboo, the strongest, most durable bamboo in the world. Each rug includes an applied, non-slip rug pad backing (patent pending). No need to spend extra money on a rug pad! Provides superior cushioning, keeps rug in place and extends the usable life of the rug. Environmentally friendly bamboo is harvested from controlled forests. Expertly kiln-dried and carbonized to help resist cracking and warping. Multiple layers of polyurethane coating to help protect against scratching and staining. Polypropylene border with heavy-duty stitching resists wear and fading much better than cotton. Suitable for indoor use.